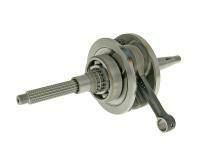 Great quality Naraku crankshaft for air-cooled Yamaha and MBK 125cc engines. Features HD big end bearings. For use on Yamaha 5ML (4-valve from and including 2004) and ideal for standard and big bore cylinders. Ready to install.